Do You Know About the Cable Clip? Fiber optic cables are almost ubiquitous in this highly technological day and age. In your household network, you may find cables running through televisions sets, DVD players, desktop computers, speakers, and video projectors. Optical cables are the must-have components in insuring the smooth network connectivity. What’s more, with the increasing requirement of the network speed, more and more cables will be deployed. Therefore, cables must be kept organized and out of the way to prevent interruptions and obstructions. One of the best method to keep numerous and lengthy cables in order, in any space, is to utilize a cable clip. This article will provide some information about what you need to know about the cable clip and its function. Before we come to the introduction of the cable clip, let’s firstly have a review of the fiber optic cable. Fiber optic cable may resemble the copper wire cable, but what lies beneath the sheath is different. An optical fiber cable is a cable containing one or more fibers that are individually coated with plastic layers and contained in a protective tube suitable for the environment where the cable will be deployed. Cables have countless applications in business and industrial settings based on different type of cables. In work environments, they can be found snaking behind computers, telephones, printer stations, and other electronic devices. And in industrial sites, cables are necessary for a wide range of markets: electrical, factory automation, natural gas production, steel, refining and petrochemical, pulp and paper, and wind, power and solar generation. The primary role of the fiber optic cable is to enable functions like communication, signal transmission, and instrumentation and control, and are essential components of transmission devices, multi-point and single-ended networks, and converters and repeaters. In terms of cable installation, cables should never be allowed to hang freely for long distances or to press against edges. There are some guidelines that installers must keep in mind. 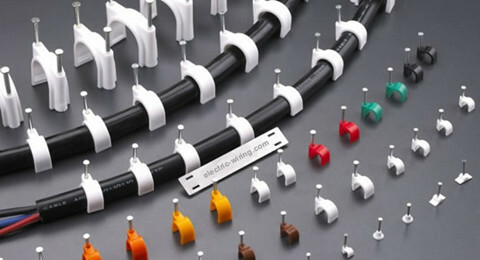 In order to well organized the high-density cables, some cable management elements are needed. FS.COM custom fiber patch cords are made to meet your special requirement just as the image shows above. The following part will go on to talk about one of the items used in cable management—cable clip. What Is the Cable Clip? A cable clip is a device that manages wires and cables and secures them to a fixed point on a surface, like a wall, ceiling or floor. A wide range of cable clips is available to control cables of all sizes and shapes, in almost any number, in both home and industrial applications. The following shows different size of the cable clips. Generally, a cable clip contains two important components: one mechanism for gathering cables together securely, and another provision for holding the entire cable clip (along with the gathered cables) fast against a single spot on a surface so that the entire bundle stays in place. Some manufacturers design products so that these two mechanisms come separately, although combining them provides better utility and a number of advantages. One particular type of cable clip is designed as a single piece of material (like plastic) to hold wires and cables on one end, while a hole is provided on another end through which a nail can be used to secure the clip to a wall or other surface. However, this type of cable clip may not be suitable for surfaces that should not be damaged by hammering a nail into them. In such cases (especially for instances wherein securing the cables together is only meant to be temporary), another type of cable clip may be more appropriate — one that comes with an attached adhesive area that can be easily stuck to the surface without creating a hole or damaging it in another way. Once the cables can be let down, the cable clip can be simply removed. To sum up, cable management can have a significant impact on the management in a data center or any network infrastructure. Keeping network cables and optical devices neatly managed has been more and more critical for the effective management as density and application complexity have proliferated. The cable clips are indispensable to ensure the cables well managed and laid in order. FS.COM offers a full range of cable management accessories including fiber splice tray, cable manager & wire duct, cable management rings, cable ties, wire loom and cable wire markers, cable lacing bars and so on. All of our products, especially the fiber optic cables (like LC to SC patch cord and LC to LC patch cord) are warmly welcomed by customers. If you want to know more about our products, you can send your request to us.